Taking a momentary break from posting my holidays snaps (travel sketches), here is one I did here in Davis this weekend past, St. James Church across from Community Park. This is one of the pieces I am submitting for the Pence Gallery’s annual Art Auction. The Art Auction exhibit will be between Sept 1-15, with the Gala event itself on Saturday Sept 15. Find out more at http://www.pencegallery.org/events.html. 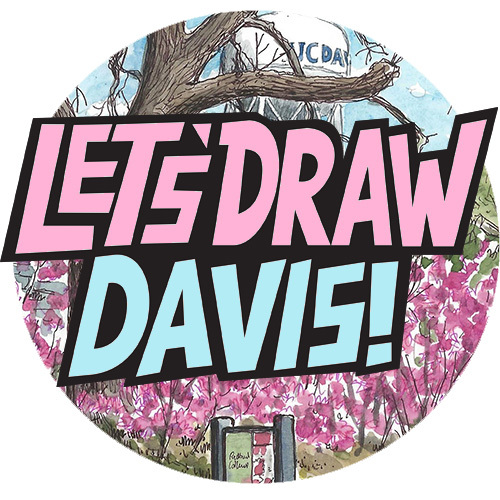 Anyway, this building is not far from our house and I have drawn it before, but always wanted to go back and do it again. It’s a tricky one to draw, because it’s mostly roof, an interesting design but tricky to fit in a satisfactory way onto a sketchbook page, it’s longer than you expect and I could never find a view I liked. Then as I was cycling past I realized the view which includes the sign is pretty nice and encompassing, so I chose that. It’s funny that this is St James, because I was just in Portugal where many of the churches were on the route of the Camino Portugués, the Portuguese pilgrimage route to the famous Santiago (that is, St James) de Compostela in Galicia. You can tell this because of the abundance of signs of the scallop shell, which is the symbol of the Camino Santiago. I have been fascinated with the Camino since I was a kid, the main one that is, across northern Spain. I’m not religious or follower of Christianity or anything, but I do love all the old churches and buildings (I like sketching cathedrals), and I love the idea of taking a walking journey across a long distance to reach a faraway place, knowing that many others are doing the same or have done the same in centuries past. Also I just like exploring. One thing I didn’t know though was that travellers on the Camino will wear those scallop shells on their backpacks as markers that they are on the pilgrimage. That was very interesting to spot, but I also started to see the scallop shell symbol everywhere. Now you probably won’t see that shell in this building here in Davis, because firstly this is not on the traditional Camino routes to Santiago de Compostela, and secondly the scallop shell is the symbol of St James the Great, while this church (according to their website) is dedicated to St James the Young, a different James. They were both Apostles I guess, but one of them really liked shells and the other really didn’t. My sister used to go to a St James Catholic High School in Grahame Park in north London (originally it was in Burnt Oak), though I don’t know whether that was shell James or non-shell James. Anyway this building here in Davis was built around 1975, actually it looks a little bit like another building from my old neighbourhood, Burnt Oak Library, with that large pyramid-like roof. 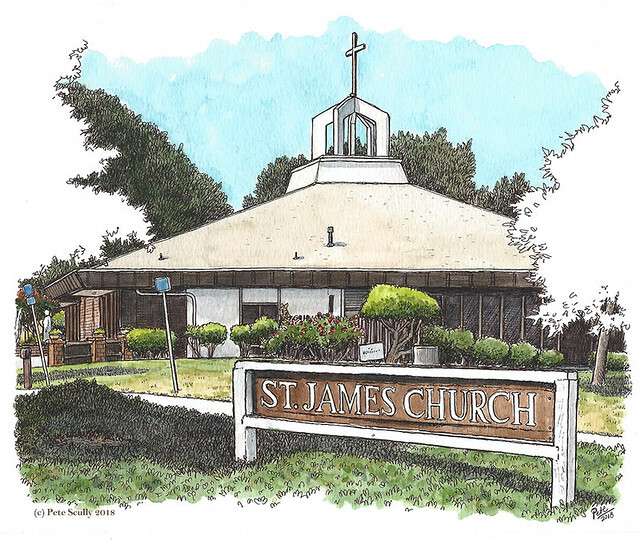 You can find out more about St James Church in Davis on their website, https://www.stjamesdavis.org/about-us, and you’ll notice that they have a sketch on there by a local artist called Pete Cully, I must check that guy out. There’s also a history, which includes a photo from the 1970s of the very same view above, with the sign, but without all those big shady trees. Really cool to see the difference.